Other Aliases: Designation B03, K.F.. Known Relatives: Rudolph West (father), Mary West (mother), Barry Allen (Uncle). Height: 5’7” Weight: 150 lbs. 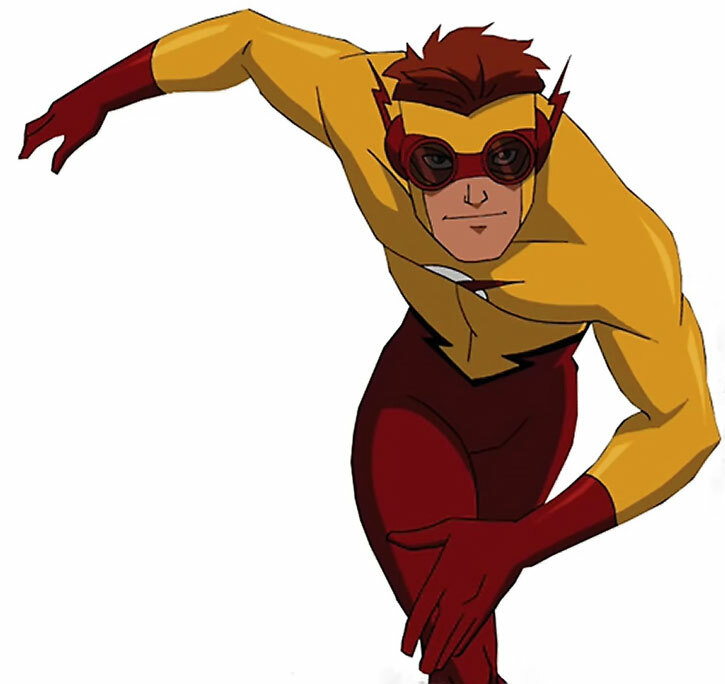 Kid Flash possesses the power to move at superhuman speeds, and as such, is the fastest teen alive. With effort, he can attain speeds that exceed 720 mph, breaking the sound barrier and most of the laws of physics at the same time. 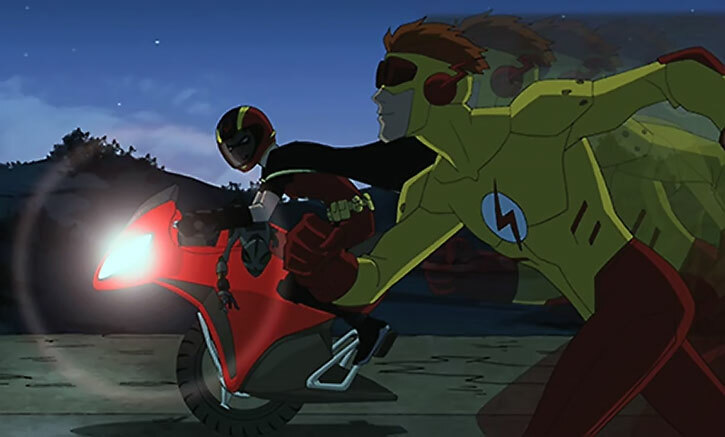 Unlike his mentor (and New Earth counterpart), Kid Flash is still affected by several of the environmental effects that go hand in hand with high speed travel. 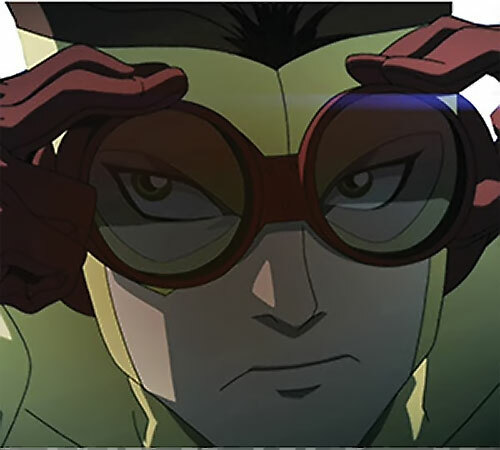 Fortunately for him, his physiology has become resilient to the medium velocity impacts he is sometimes forced to endure, and he mitigates the majority of the other effects through the use of his costume and a pair of goggles that he uses to protect his eyes. Wally is still learning the tricks of the trade but has in the past demonstrated a few superspeed power stunts such as: creating wind vortexes by spinning like a top, racing up the wall of a three story building, and he even attempted to vibrate through solid matter once (he ended up with a nose bleed). Even before Wally gained his superhuman abilities, he was a stand out in a crowd. Ever since he was a boy, Wally was somewhat of a prodigy when discussing matters of science and he used his gift to define the world around him. When he accidentally discovered that his uncle Barry was the famous hero, the Flash, he immediately put his intellect to work to discover the source of his uncle’s powers. Eventually, by using his Uncle Barry’s journals, Wally was able to identify all of the divergent variables that caused his uncle’s accident. He recreated the event with himself as the subject. 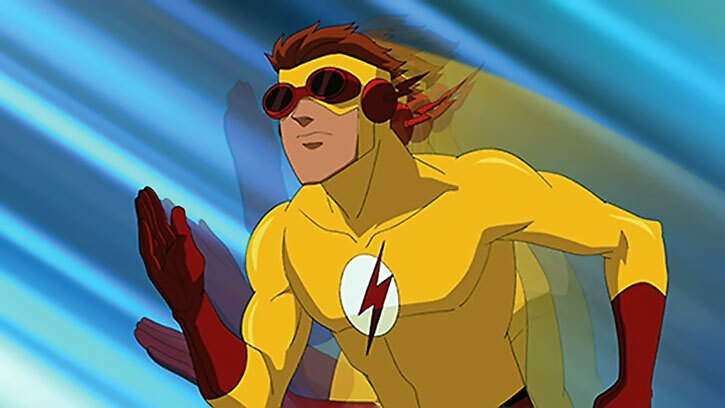 In a “flash” he became the fastest teen alive. After all, he wasn’t even 15 yet. 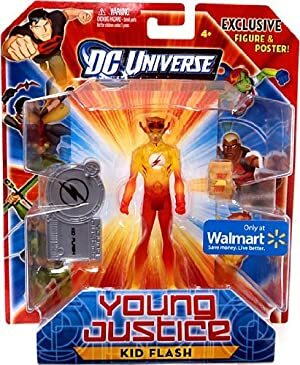 It wasn’t long before Wally created a heroic identity for himself and began adventuring alongside his uncle, fighting crime throughout Central City as Kid Flash. It isn’t known exactly how long the two battled crime as partners before Barry (and the rest of the League) felt that Wally was ready for League membership. When the invitation was extended to him (in addition to the other sidekicks), Wally couldn’t contain his excitement. He surged through adventure after adventure until his day of official induction came. For Wally, the Fourth of July couldn’t come soon enough. That day started out like any other; with the scarlet (and yellow) speedsters foiling Captain Cold, who was in the middle of a jewel heist, while on their way to the Hall of Justice. At the conclusion of the battle, both of the Flashes raced to the Hall, in Washington DC, and assembled alongside Wally’s friends and their mentors. To his chagrin, Wally and his uncle Barry were the last to arrive, as always. 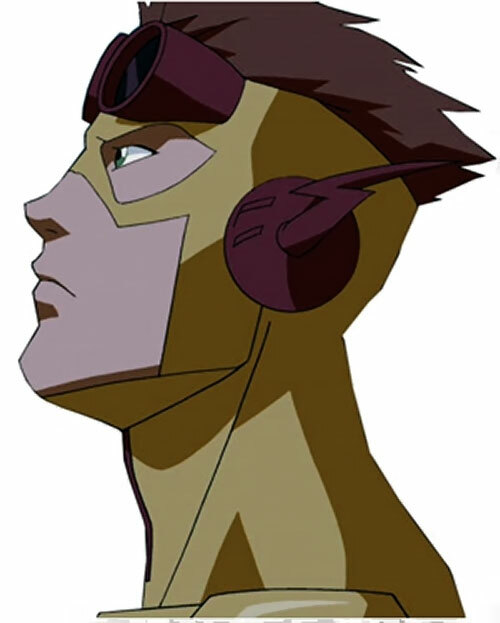 Kid Flash was suitably in awe as he and the other protégés had their tour of the Hall of Justice, but was quickly disappointed when he realized that he would still have limited access to the League’s true headquarters and that he would still be considered a junior member of the League. Despite this revelation, he chose to stay with Robin and Aqualad when Speedy stormed out of the Hall in anger at their treatment. With the air taken out of his sails, Wally sat back to wait as the League left suddenly to address a critical matter. At least he did until Robin convinced him that they could show the adults up at their own game. It took very little effort to persuade Kid Flash to accompany Robin and Aqualad in aiding the local authorities to curtail a fire that had broken out at Cadmus Labs. In the course of their actions, the heroic trio unintentionally: uncovered the secret Genomorph Project deep within the bowels of Project Cadmus, freed the slumbering Superboy and brought the corrupt head of the facility to justice. Despite the success the 4 young men enjoyed (Superboy joined their number), they found themselves on the receiving end of a reprimand from the adult members of the League. When the other protégés fought back, Kid Flash added his voice to their number, specifically defending Superboy and claiming that the newly freed clone was one of them. In the face of their combined passion and conviction, the adults had very little choice. Batman decided that he would have to find a use for such youthful passion. Four days later, Aqualad, Kid Flash, Robin and Superboy were officially inducted into the Justice League’s covert operations group (operating out of Mount Justice). At the same time they introduced to their fifth member, Miss Martian. 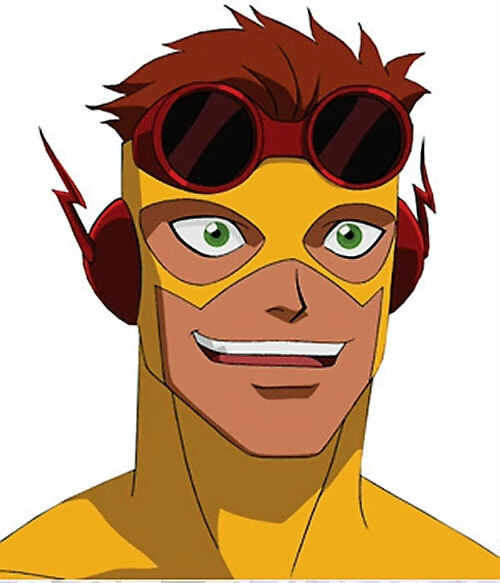 Wally West is a handsome young man who has spiky red hair, freckles and green eyes. Unlike his larger teammates Superboy and Aqualad, his build is much like that of a long distance runner. When in costume, he wears a bright yellow and red body stocking made out of a spandex-like material. The costume is reminiscent of the Flash’s, but has a few major differences. The costume’s upper torso and boots are a bright yellow, and are separated from its red leggings and gloves by stylized black lightning bolts. Directly in the centre of the costumes chest sits a white circle divided by a stylized red lightning bolt. 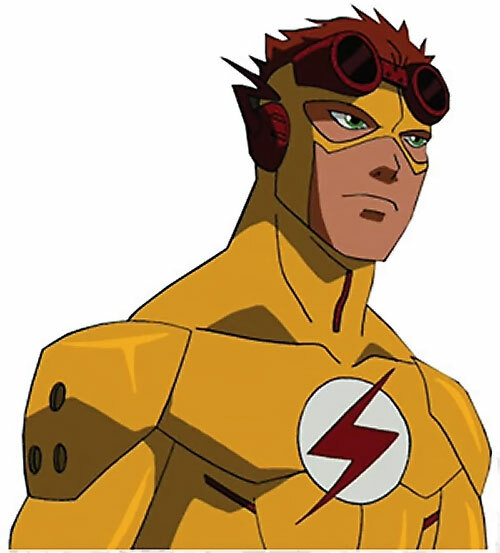 Unlike the Flash’s costume, Kid Flash’s cowl (which is yellow like the rest of the upper torso) has a hole on the top so Wally’s hair is out. The suit itself is highly resistant to friction as it is capable resisting the elements during high velocity travel without wear. Wally completes his costume with a set of red goggles that he uses to protect his eyes from the elements. In his civilian garb, Wally wears the typical clothing one would expect to find teens his age clothed in. 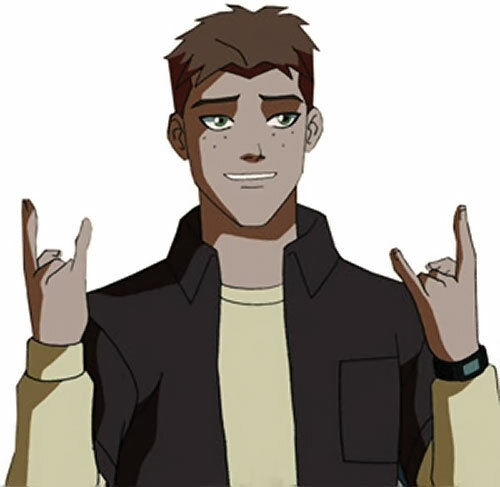 Every team/group/class has a clown and despite his heightened IQ, Wally West is that clown. He always has light-hearted comments for his friends, and can often be found trading jokes or slinging good-natured insults which no one takes personally. One of the best things (and worst things) about Wally is that what you see with him is what you get. He says exactly what is on his mind without much of a filter. Quite often, it seems as though his mouth moves and reacts faster than his brain (which is actually saying something since the speed of his thought processes have been heightened as well). Even if he didn’t have “superspeed” Wally probably would have been somewhat hyper-active. As it does to many other speedsters, the world seems to be moving in slow motion to Wally most of the time. As a result, he can be and often is extremely impatient and impulsive to the point where he reacts to situations before thinking, which to date usually puts him at a disadvantage. At this point in his life, Wally is basically a walking hormones bucket. He is completely girl-crazy and has an extremely hard time resisting the urge to make suggestive remarks, flirting or outright hitting on any attractive women in his vicinity. For the most part, he is completely focused on Miss Martian, but that doesn’t stop him from hitting on full grown women like the Black Canary if she’s directly in front of him. Wally likes to collect souvenirs from his adventures. Some examples of the items he has acquired over his adventures are: one of the eyes from the robot Brom Stikk, the arrow that Artemis shot at Amazo, the mask left behind by the assassin Cheshire, and the Helmet of Doctor Fate. 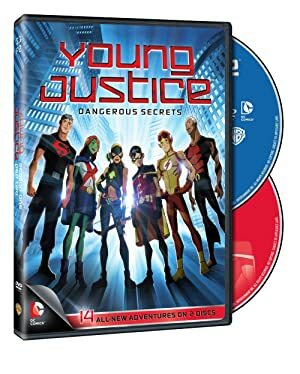 The events of Young Justice are canonical and take place on Earth-16 within the DC Universe. 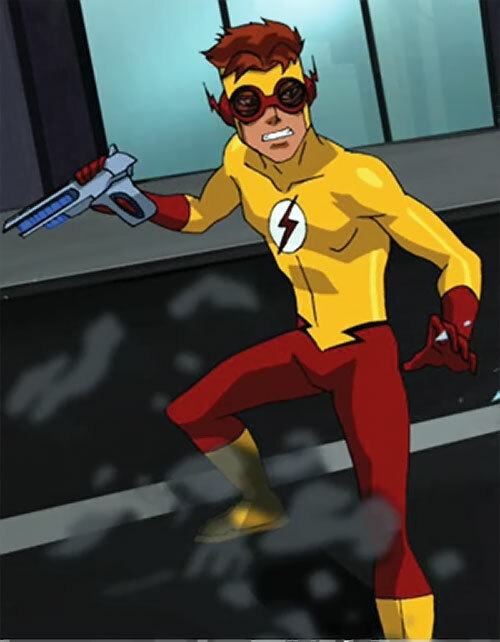 Any travel through the DC Multiverse could potentially bring the player characters into contact with this version of Kid Flash. Superspeed: See boxed section below. Area Knowledge (Central City), Expertise (Chemistry), Headquarters (Expansive), Insta-Change, Lightning Reflexes. The Flash (High), Young Justice (High), Justice League (Low). Age (Young: 15), Gradual Loss Vulnerability (Lack of Nourishment; Physical Stats and Superspeed), MIA toward Collecting Souvenirs, Secret Identity. Goggles [BODY 02, Shade: 02, Telescopic Vision: 03, Thermal Vision: 02, Do Nothing: 04, R#01]. At this point in his career, Kid Flash is still relatively inexperienced and when you consider how potentially powerful he is, it shows immediately. 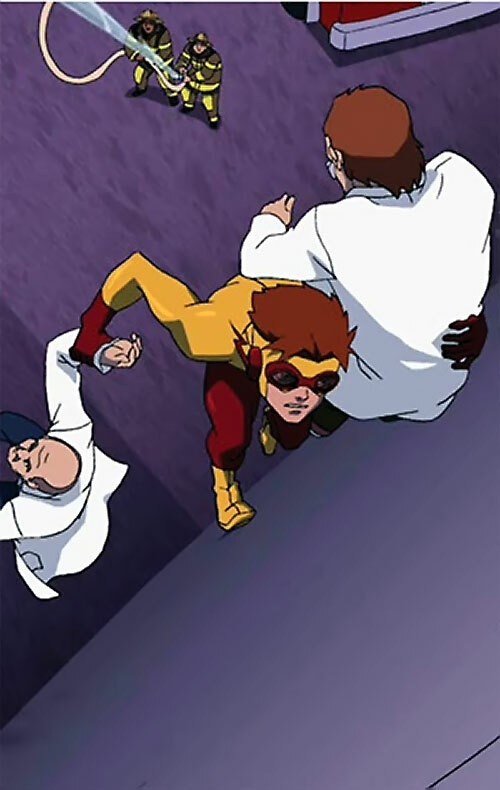 Unlike most speedsters, Wally is still partially affected by real world physics. Wally can’t go from zero to full speed instantly. In most cases, he needs a little room to ramp up and accelerate his speed before he can make full use of it. In addition, due to his relative lack of control Wally sometimes experiences difficulties cornering or braking when in high velocity motion, especially in enclosed rooms or cramped corridors. In general, in locations such as this he usually keeps his speed at a level he can control (anywhere from 5 to 8 APs). 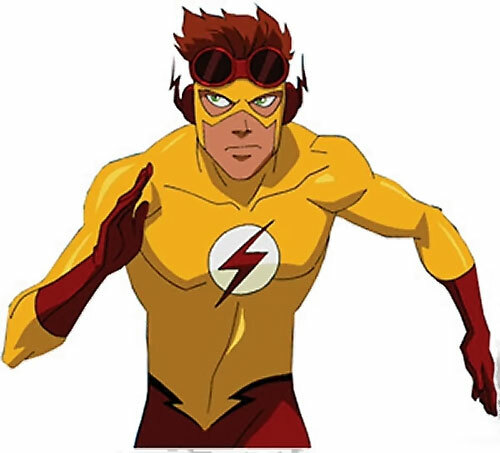 In game terms, whenever the GM decides that Wally’s speed must become a dice action (sudden stops, accelerating up a winding flight of stairs, etc), Wally must use his DEX as both the AV and EV for the action check instead of the APs of his Superspeed. Note that while Wally has demonstrated in one offs the typical trick powers associated with speedsters (air control, cling) these were definitely power stunts and haven’t yet developed into outright powers as of yet. Finally, Wally’s powers cause his metabolism to burn calories at a much higher rate than that of the average man. Because of this, he is constantly eating large quantities of calorie rich food to sustain himself, otherwise his body would most likely fail due to the lack of adequate nourishment. 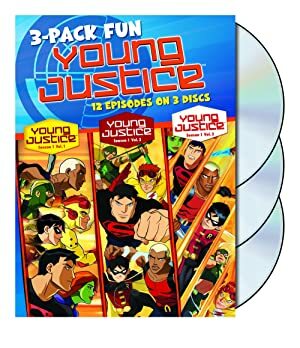 Source of Character: Young Justice television series, episodes 1-9 (voiced by Jason Spisak). Helper(s): Darci, PufnStuff, Ethan Roe, Young Justice Wiki, Azrael.